It seems as though nearly every woman has a hormonal imbalance. I'm surprised how women are still able to get pregnant! But then again, I personally know several women who needed some type of questionable medical intervention so that they would be able to have a child. In all honestly, we shouldn't need help. As women, giving birth is one of the major roles our bodies were created to do! It shouldn't be this hard. Thanks to the hectic modern lifestyle, conventional medicine, and food giants, it's easy to fall into hormonal imbalance, sometimes without even realizing it. How can you tell if your hormones are off? There are many tests that can be done -- both at home and in an office -- namely serum blood, saliva, urine, and dry urine tests. Sadly, though, many doctors will not even do a hormone test unless you're already trying to get pregnant (at least this is what I ran into a few years back). This isn't good! When our hormones aren't balanced when we get pregnant, multiple health risks arise for both mother and child throughout the pregnancy and birthing. This is something we need to balance before trying to have a child. Even if you (like me) don't plan on having a child anytime in the near future, it's still important to stay on top of your hormones and make sure they remain balanced -- as imbalanced hormones can cause many health issues and often times can even create problems at home or work. If you decide to take a test (I recommend finding a qualified functional medicine practitioner for the most accurate results), great! It can definitely help you see where your hormones are at the moment so you know how to correct them. But if taking a test is a bit out of budget right now or you need more convincing, there are plenty of signs and symptoms of hormonal imbalance that you can use as a tool to see if your hormones are in balance or not. Back pain before and during your period and/or back pain during ovulation. Spotting before or after your period -- spotting (or light flow) for a day or more before getting your "normal" flow. PMS *all types* -- before, during, and/or after your period, or during ovulation. This could be emotional things like mood swings, anger, or depression as well as physical changes and pain like bloating, cramping, and constipation. Cravings around your cycle, especially for something sweet. Period is too long or too short -- 3-5 days is normal. Period is extra heavy (possibly with clotting) or extra light (spotting). Menstruation cycle is too long or too short. The average length of a healthy cycle is 28 days, but anywhere from around 21-35 days can be viewed as healthy. Breast tenderness around your period. Poor sleep or insomnia before or around your period. Hot flashes, esp before your period. Stubborn weight that just won't go away, esp around the waist. Hormonal acne -- particularly systemic acne around the chin and jawline. Other possible clues for hormonal imbalance. 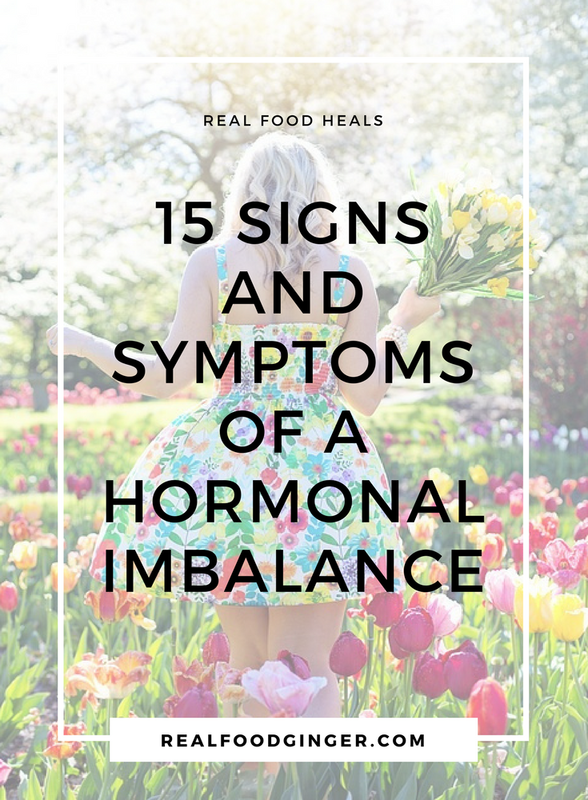 Of course there are other possible signs and symptoms of a hormonal imbalance. If one has adrenal or thyroid issues, they, too, will have a hormonal imbalance since they are partially in charge of producing hormones for the body. Also, if you are going through a bad menopause, this too is a sign that your hormones are off. Neither your periods nor menopause is supposed to be painful...! Crazy to think about, am I right? But it's true! When our bodies are working as they should, our hormones will work as they shouldand there should be an easy, non-painful transition to our periods as well as to menopause. If you are on birth control right now, these symptoms may be mitigated, but that does not mean you don't have an imbalance. Think about it as if you went off your birth control -- would any of these symptoms exist then? Many women get on birth control because of some of these symptoms. But unfortunately, birth control only covers up the symptoms and does not address the root cause -- usually being a hormonal imbalance. How many of these signs and symptoms do you suffer with on a monthly basis? Have you ever gotten your hormone levels tested? Let me know in the comments! Dr. Oz: Is Your Period Normal?